Having the Andes mountains as natural reverberation device it's no surprise that Alisu (= girl) and Rolancho (= boy) spend a good deal of time to blend ravine-deep textures with intense rhythms - playing hide and seek somewhere in the grey urban area between minimal techno and glitchy experimentalism. Get caught by the beat, take a breath and back-pedal its meaning in your own neuro patterns, get caught again, and so on and so forth. 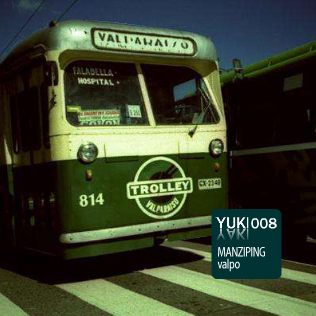 The concept of Manzping's first EP for Yuki Yaki - after numerous releases and compilations for Chilean netlabels - is a refreshing dive into a sea of blue hypnosis, a splendid ride between captivating beat pulses, sparkling electric discharges and floating ambient carpets. This is a taste of South America that will wipe off even the most flagrant omen of winter depressions in these days. bring on the global tour! thnxs to all yuki yaki crew..Darwin for the cover pics.. DAnieto 4 mastering the tracks.. Transistor & Choenyi 4 tha remixes..
wow ..despertando is awesome and the transistor remix also fu..... hot.